The LA Auto Show wraps up this weekend after two weeks of big reveals for small cars. I had the opportunity to get to the show twice in a week to cover all the new cars and big news coming out of LA this year. Of course the biggest of the small news is the reveal of the US-spec Ford Fiesta. The highly anticipated Ford Fiesta, sporting a 1.6 liter engine and 40 MPG will include the new PowerShift electronic dual clutch automatic transmission. This will allow the Fiesta to be lighter than a typical automatic transmission car and has a sealed internal lubrication so it is maintenance free. 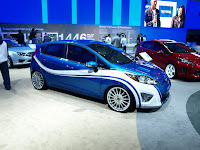 The Ford booth was packed with Fiestas in all trim levels and colors and even a few tuned and dressed up ones. Even though the Ford reps had no details on this H&R car it did look good with 18" wheels, lowered and with a vented hood. Ford even had a Fiesta Passport game that sent you around their booth looking for different fun things to do and then you had to make your way around to all the Fiesta's to collect stamps. My price was a $5 dollar Best Buy gift card and a Fiesta Keychain. The new Mazda2 was announced for the US market without specifics. It is known that the car is based on the same architecture as the Ford Fiesta but the engine and driving dynamics being specifically built to Mazda’s "Zoom Zoom" quality. 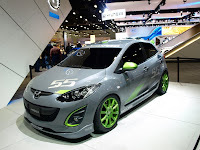 I asked Mazda if there were any further details, especially on the MazdaSpeed2 they had showing but all I was told is that it will be on sale summer of 2010 as a 2011 model and it will be a couple months (Detroit Auto Show maybe) that we will hear word on specs and pricing. 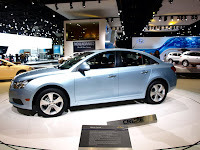 Chevrolet had its big debut of the US Chevy Cruze compact car that will be replacing the Chevy Cobalt next year. With choices of a 1.8 liter or turbocharged 1.4 liter producing about the same power but with the 1.4L getting about 40 MPG. Chevy was also big on pushing the Volt with a large display, theme song and dancers. What Chevy was not big on was discussing the Aveo replacement. What information I did get was the Chevy Spark will be built by Daewoo and will not get to our shores until at least 2012 as a 2013 model. There will be changes made to the car, but what they are not certain of. As far as model refreshes go, the Kia Rio will be getting an updated appearance with the new corporate grill and removal of the black plastic trim from around the car. Mechanically the car will be the same, but you can expect some new interior upgrades to go along with the Rio's new attire. The big winner of the show for big news on small cars goes to Mitsubishi with its announcement of the Colt here in the USA. The EVO-nosed Colt is a current global car for Mitsubishi and will be up against a tough and growing crowd of B-Segment cars like the Ford Fiesta, Mazda2, Toyota Yaris, Nissan Versa, and Honda Fit. No details have been given yet, but Mitsubishi did say that we can expect a manual or CVT transmission and a MIVEC engine. A turbocharged Ralliart version is sold in Japan and would be the fastest B-segment on the market if introduced. As for Suzuki and the Swift, lets just say I was told "Yeah we think it might make it to the US sometime. 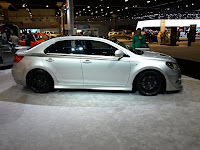 Hey did you see the new Kizashi?" 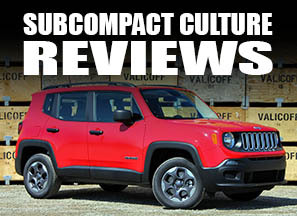 Thanks Suzuki, glad to see you are looking out for the fastest growing car segment in the US by not giving us the best subcompact sold everywhere else in the world. Well, let's hope it does indeed come to the US sooner than later. Interesting. Yeah, Suzuki tends to push what they excited about, not what car drivers are excited about. I talked to them twice last year about the Swift, and got a "sorta, maybe" kind of answer. Maybe they are afraid of a glut of small cars, and getting lost in the shuffle. It may be too late to bring the Swift. 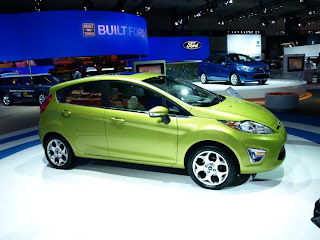 Most buyers with money to spend, and an interest in compacts, have their eye on a new Fiesta or Mazda2 next year....those that don't go for an established compact/subcompact like the Fit or Accent. I think Suzuki needs to bring the Swift, and I think they will. However, I simply don't think they're talking much about it yet. That's just my gut instinct. Well, timing is everything. I think Suzuki needed to bring the Swift a two years ago, to compete with the Fit and Yaris. Or by the spring of 2011, at the latest, as an alternative to the Fiesta and Mazda2. It doesn't sound like that will be happening. 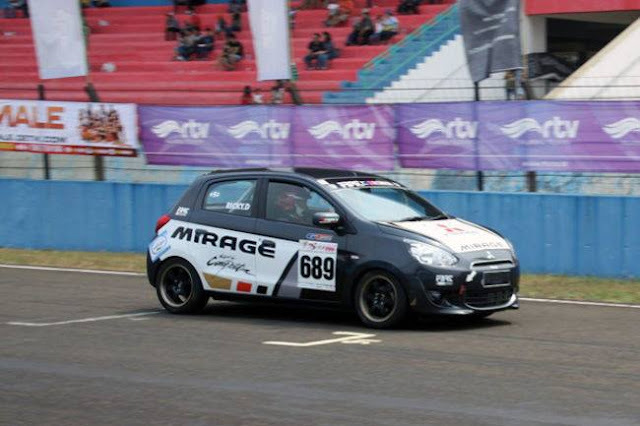 Now, with talk of the Mitsubishi Colt and others coming, the field will be really crowded. I have always got 16+ kms per litre in the city, even with AC. Excellent car for small families. Rear leg room is very limited - comfortable only for kids.